Agile Service Management ensures that ITSM processes reflect Agile values and are designed with “just enough “control and structure in order to effectively and efficiently deliver services that facilitate customer outcomes when and how they are needed. We accomplish this by adapting Agile practices to ITSM process design. Implement service management in small, integrated increments and ensure that ITSM processes reflect Agile values from initial design through CSI. By being able to incorporate a variety of tools from many practices, the Certified Agile Service Manager (CASM) can engage both the operations and development sides of the organization when defining and documenting processes, engaging in a major project or just move through these steps as part of an improvement project. 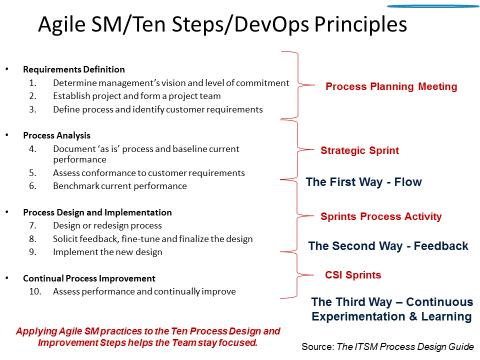 By incorporating these DevOps principles along with the CASM role, we can begin to incorporate the idea of process and functional integration much earlier in the development lifecycle. It allows us to take into consideration the needs of both Dev & Ops and deliver processes that will continue to meet business requirements long into the future.